The Cloaking Burrow-nit (ハオリムシ?, lit. : "Haori Insect") is an insect-like creature found in Pikmin 2. It has a dark blue shell with large, red eye-like markings on it. When it hunts, it chooses a place where it rests face-down in the ground, patiently waiting for its prey to draw near. If it is approached, it emerges and attempts to follow and attack the Pikmin until they escape out of its pursuit range, when it then promptly returns to the spot where it was resting and re-burrows its head to wait for its next opportunity to chase prey. It has a sharp proboscis which can be thrust into prey, piercing the victim and causing damage, right before sucking it up and swallowing it. Burrow-nits, primarily the one in Wistful Wild, will deconstruct nearby bridges, similar to Sheargrubs. This creature isn't seen too often, and is not very dangerous, as it only can kill one Pikmin at a time when it attacks. 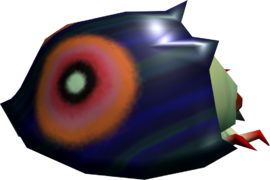 This creature's replacements, the Joustmite and the Flighty Joustmite, appear in Pikmin 3 with a different look, but nevertheless with the familiar proboscis and eye-markings. The Cloaking Burrow-nit hides underground with its large shell protruding to the surface. The eye-like markings appear on the back of the shell, so what appears to be its front-side from a distance is actually its rear. When approached, a Burrow-nit will hastily raise its full body to the surface and begin its attack. Its shell protects its rear end entirely, and any Pikmin that lands there will simply slide off. Its face, however, is not protected and can be damaged easily, as it needs to be facing its prey to attack. Though the Burrow-nit is a creature of decent size, it will be defeated within seconds if attacked by a considerable number of Pikmin. The creature has one basic attack: it will shoot its proboscis out to quite a range, snagging the first Pikmin it comes in contact with. Once in the creature's grip, a Pikmin will be eaten after a few seconds. If it eats a white Pikmin, the creature will die instantly. When being attacked the Burrow-nit may also shake all Pikmin from it. Interestingly, when a Pikmin is speared, a red liquid bursts out. It is currently unknown what this liquid is. Swarming it is a suitable method, and 25 Pikmin are enough. Aim for the face mostly, but even if Pikmin are told to attack the hard shell, they usually revert to the face eventually. Purple Pikmin can also be thrown at its back or face, with a chance to stun it. Even if it does stab a Pikmin, it is slow in ingesting it, so if you can kill it before it's done with its meal, the Pikmin will survive. Alternatively, if you are concerned about losing any Pikmin, use both leaders, and repeatedly punch the creature's face while making sure not to be hit with the proboscis. It may attempt to shake off the leaders, but this action can be foreseen and avoided easily. The Cloaking Burrow-nit is called such because its hide resembles a cloak, and because it burrows under the ground; "nit" is a name given to head louse, a real-life insect. Its Japanese name is ハオリムシ? which translates to "Haori Insect", a Haori is a traditional Japanese sort of hip- or thigh-length kimono-like jacket. Its scientific name is Trilobitins reclusiva. Trilobitins may have to do with its resemblance to the real world horseshoe crab, a relative of the prehistoric arthropods known as "trilobites". The Cloaking Burrow-nit looks like a "backwards" horseshoe crab, with its proboscis in the spot of a horseshoe crab's tail, and fake eyes in the spot where the real eyes and face would be on a horseshoe crab. The "reclusiva" in its name could translate to "reclusive", given its solitary nature and tendency to burrow underground. Internally, it is called armor, given its strong hide. A Cloaking Burrow-nit can be seen in the background of the Distant Planet stage in Super Smash Bros. Brawl, but other then that, it has no trophy or other mention in the game. Artwork of a Cloaking Burrow-nit. Frontal view of the Cloaking Burrow-nit. A Cloaking Burrow-nit on the Piklopedia. Olimar fighting seven Cloaking Burrow-nits at once in unused cave last_4. The creature's e-card, #27 (8th red card). Under the floor in the title screen's autumn variant, there is a Cloaking Burrow-nit. This page was last edited on February 13, 2019, at 20:17.